Phone emits too much heat. Solution 1. 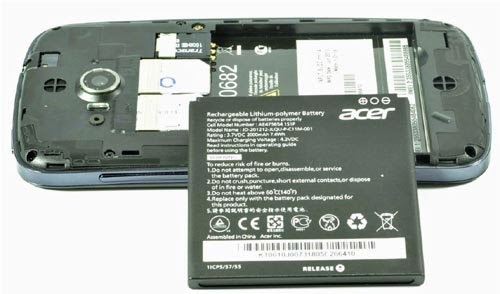 When a phone like the Acer Liquid E1 randomly shuts down or reboots, the first thing you need to look at is the battery. Pop open the back panel, remove the battery and check if the battery's connection interface is corroded by anything, clean it with a dry cloth. Do the same for the battery receptor on the phone. Place the battery back and turn the phone on. Observe if the phone still reboots or shuts down. Solution 2. If you have recently installed an app then this problem happened, there is a possibility that the app caused the problem or at least triggered it. You need to disable the app at once and observe the phone if it still reboots or shuts down after that. If it does, try to find other apps that may be causing the problem. If you don't have any idea which app causes it, a Factory Reset is necessary to bring the phone back to its original settings. But you have to backup all your data first before doing it. Solution 3. In case the phone emits too much heat, remove the battery and inspect for some physical damages. While it is normal for the phone to emit heat when in use, it is not normal if the heat it gives off could burn your skin or unnatural. If the battery has swollen or gives out liquid, it is defective. Buy a new battery to prevent further complications. Remember, defective batteries may explode when overcharged. Solution 4. After doing everything and the phone still has a problem, it's time you had a technician look at it. There could be some problems with the phone's hardware and there's nothing you can do about it. If you are currently experiencing problems with your Samsung Galaxy S3 smartphone, do not hesitate to contact us via sebertech@gmail.com and we will do our best to find solutions. I'm not sure if this is the correct forum or even site to be posting about issues/problems, but it seems pretty popular so I thought I'd give it a shot. One week ago I bought a new unlocked Acer Liquid S100 / A1 (running standard OS Donut 1.6) off of eBay and I'm already experiencing problems with it. In short, the phone turns off by itself several times per day, whether it is in a pocket, bag, or just sitting on the table. The battery definitely has plenty of charge remaining (per the battery indicator icon, time of use, and a percentage battery life widget I installed from Marketplace) when this happens, although it does seem to happen more when the battery life nears about 50%. The battery itself seems to fit well (i.e., not loose or moving around) and the battery contacts appear clean and undamaged. I am using it on an AT&T 3G connection (HSDPA 850, 1900 bands) in the United States; the eBay store (ac-electronic , eBay seller ID mobile-tone) suggested the problem might be because it is an HSDPA 1900 / 2100 phone, but I'm very skeptical. After all, 1900 band is common to both. I tried a hard reset / clean boot and it didn't help. One thing to note is that it never happens when it is plugged in and charging. Acer Support told me to ask my point of sale for help, but the seller is no help. The seller's policy is that the buyer is responsible for shipping (approx US$70 each way) for any returns or exchanges. Due to the relatively recent release and limited availability of the product, I realize this post is a long shot, but I'd be very grateful for any advice or solutions offered.